Quality felt Christmas stocking made with a smooth red felt body and white felt top trim. Quality felt Christmas stocking made with a smooth red felt body and white felt top trim. A classic bright Christmas stocking measuring 50cm top to toe length and 22cm brim diameter. A strong hanging loop is provided and the front of the stocking is lined on the inside. Quality felt Christmas stocking made with a smooth red felt body and white felt top trim. A classic bright Christmas stocking measuring 50cm top to toe length and 22cm brim diameter. A strong hanging loop is provided and the front of the stocking is lined on the inside. Made from sturdy felt fabric and is easy to store flat after Christmas. This stocking will look fantastic on Christmas morning filled with those great stocking fillers and presents. 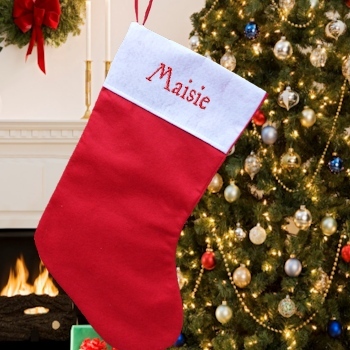 This stocking is personalised with a name or initials embroidered in shiny red thread in Xmas Print or Fancy Script font. Please fill in the name you want sewn in the options box provided, please double check your spelling. Personalised gifts are made to order in approx. 2 working days.